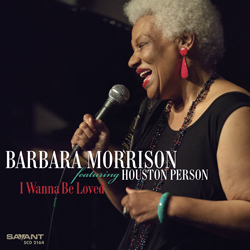 Barbara Morrison, one of the world's most delightful and endearing jazz personalities returns to the recording studio and brings her good friend, tenor saxophonist Houston Person with her for her third recording on Savant Records. Her patented Music in the Morrison Manner, featuring blues, standards and even an occasional pop tune, has endeared her to audiences on both coasts and earned her a place among the most talented and skilled jazz vocalists working today. Morrison's delivery and vivaciousness has the ability to charm listeners while her timing and intonation are virtually flawless and the subtle perfection of her phrasing evokes the great vocalists of the past. The spirit of Dinah Washington hovers over this recording with many of the Great Lady's tunes receiving a Morrison Makeover while Houston Person weaves his husky-toned arabesques around the timeless melodies.